Problems With Ariens Auto-Turn Snow Blowers? I’m leaving this article up because the Internet never forgets. That said, Any issues – real or perceived – about the Ariens AutoTurn have been addressed and were fixed in 2016. If you purchased your Ariens after Sept 2016 the system works great. In fact the “intuitive differential” is now used by other companies and Ariens uses it across their entire line including the Commercial models. There are no problems with the new Ariens Auto-Turn differential. The differential itself is a welcome addition to snow blowers and I high recommend any snow blower that uses it. It is a new technology and is much easier to use than any previous snow blower. But like any new technology there is a slight “learning curve” as we get used to it. Please read this article because it does describe a few things that you should do if you are having issues using this machine. 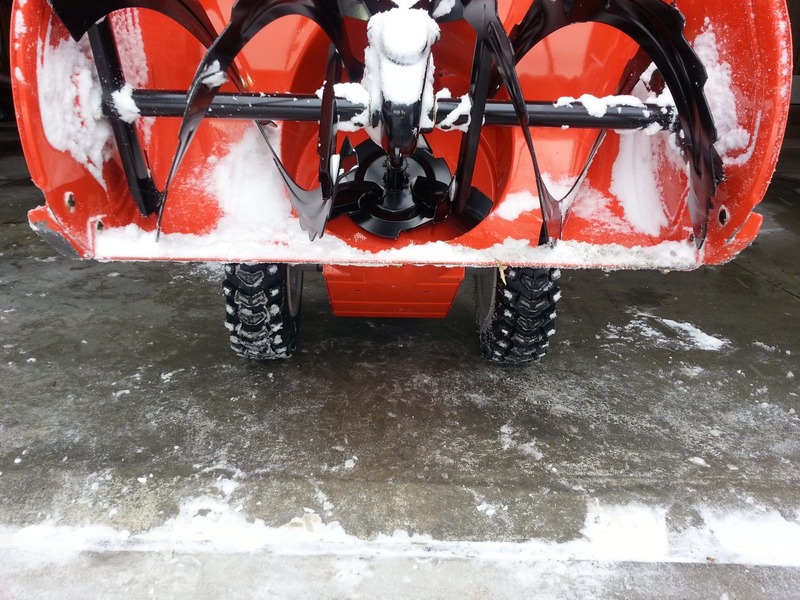 All snow blowers will give you problems if they are not set up correctly. On all models with power steering take an extra 5 seconds setting the skid shoes and checking the tire pressure. When you adjust the skid shoes be sure you are on a flat surface and be sure you raise both sides the same amount. If one side is higher than the other it will always want to pull to that side. I use a 6 inch by 22 inch piece of plywood under the scraper bar. The tire pressure should be the same on both tires. If one tire is lower the snow blower will want to turn that way all the time. Below are four items you should be aware of. Like all snow blowers it is a mechanical device and you should be aware of how to use it and how to troubleshoot if it is not performing to your expectations. The Auto-Turn is so much easier to use than a snow blower with locked or pin-lock axle that some of you are “over-steering” the machine. Take some time to get experienced with the Auto-Turn. You don’t have to “man-handle” this snow blower like the last one you used. For example, I have a snow blower that uses trigger steer. When I’m blowing snow I know that if I want to turn it just a little pulling the trigger will usually cause the snow blower to turn too much, so I catch myself forcing the handles with my hips instead of using the triggers. If you do that with the Auto-Turn it senses that you want to turn and may “over compensate” your movement. So….don’t put as much effort into turning as you are used to. Move the handles with your arms instead of your whole body and you will see that the Auto-Turn will work a lot better. Guide it-Don’t Steer It. If you buy your new Ariens from The Home Depot please read and follow all the assembly directions. In addition read Number 3 below and verify the housing is aligned to the frame. The Home Depot offers an optional set-up and delivery. This setup is performed by an Authorized Ariens Dealer and I highly recommend spending this extra $79 if you are not mechanically inclined or new to using a snow blower. The Ariens Dealer takes the machine out of the packing crate, assembles it, inspects the new unit and makes any adjustments so when you use the snow blower for the first time it works exactly as it should. (I wish all brands offered this expert setup) The Deluxe 28 inch Model 921030 Ariens is letting me use this winter was taken out of the crate, assembled and adjusted by my local Ariens dealer BARSTOW STREET AUTO SERVICE. 3. Housings are not seated on the transmission frame. Ariens makes it easy for you to change the drive belts if you ever need to. To make the belt change easy there are slotted holes in the auger frame so it is very easy to insert the mounting bolts when you re-assemble the snow blower. The new Auto-Turn is sensitive enough that if you end up tightening these bolts with one side in the top of the slot and the other side in the bottom of the slot the snow blower thinks you want to turn and it will auto-compensate all the time. So if you split the snow blower to change the belts make sure you get both sides of the housing seated back on the pivot pins. If your new snow blower wants to turn all the time lift up the front end and look at the skid shoes. If one is showing more wear than the other follow the procedure below to realign the housing to the frame. You only have to do this once. Aligning the Blower Housing To The Transmission Frame. 1. Place the machine on a smooth level surface. The garage floor is a good spot, as long as you stay away from the floor drain, since the floor is sloped in that area. 2. Verify tire pressures are correct. Recommended inflation is embossed in the sidewall of the tire near the rim. 3. Loosen the skid shoe mounting bolts so that the skid shoes are completely loose, and the scraper blade is touching the ground. 4. Loosen the four bolts (two each side) that attach the blower housing to the frame. When all four bolts have been loosened, you may notice the machine settle into a level position. 5. Ensure the frame is fully seated into the blower housing by pressing down on the handlebars. 6. Retighten the four bolts (two each side) that attach the blower housing to the frame. 7. Place a 1/8” spacer under both ends of the scraper blade and retighten the skid shoes. 8. Press down on the handlebars and gently set the blower housing back down, verifying both skid shoes touch the ground at approximately the same time. By performing these steps, the erratic motion of the machine which was being blamed on the Auto-Turn is corrected, and the machine drives in a nice straight line. Ariens shot a video yesterday showing these steps, and will post it on the Ariens You-Tube channel early next week. There are no problems with the new Ariens Auto-Turn differential. It is a new technology and is much easier to use than any previous snow blower. I compare the new Auto-Turn to how the steering has progressed in cars over the years. Going from a solid axle snow blower to the new Auto-Turn is like going directly from a 1950’s manual steering Studebaker to a 2014 high performance Cadillac with power rack and pinion steering. The new steering is much easier to use but it also takes you a little time to get used to how responsive it is. I owned a 1972 Ford F-350 truck for years. The manual steering in it was like a solid axle/pin lock snow blower. You felt very dip, bump, pot hole, and tar strip in the road and had to move the steering wheel to compensate. A 100 mile trip in that dependable old truck was more work than taking a 1000 mile trip in a luxury car. Trigger steering was a big advancement for snow blowers. Like power steering in your 1979 Dodge Polara it is much easier to use than a solid axle system. You still have to think about turning though. In other words to turn the snow blower you have to pull a handle mounted trigger to turn the unit. When you pull the trigger it releases a cog and the snow blower changes direction. What makes it harder to use though than the Auto-Turn is the direction change can be jerky and to turn the unit just a little you find yourself physically moving the snow blower with your arms and shoulders. After a few hours you are tired from using the machine. The new Ariens Auto-Turn compares to the steering in a new Lincoln or Cadillac. The steering is those cars is very easy to use and very responsive to your movements of the steering wheel. After a while you realize that you don’t have to move the steering wheel near as much or as often to drive the car. It’s a huge change over the old Studebaker and once you get used to the new steering you realize you never want to go back. Missing wheel keys. If you remove a wheel for any reason the Ariens Auto-Turn uses “keys” between the axle and the wheel rim. These are rectangular pieces of steel about 1/4 inch by 1 inch long may fall out onto the ground when you remove the wheel. Make sure you find them and put them back when you replace the wheel. Skid shoes need to be flat on ground, not tipped. When I set up a new snow blower for hard surfaces like a driveway I adjust it so there is about 1/8 inch of clearance under the bottom of the scraper. I have a 20 inch piece of wood that is about 1/8 inch thick that I place that stick under the scraper. I then loosen the skid shoes and lower them. When I tighten them I make sure the the bolts are even in the slots and that the shoes are not tipped. Tire inflation. Just like a solid axle snow blower if both tires are not inflated the same the snow blower will want to turn in the direction of the tire with the lower tire pressure. The problem is aggravated with the Auto-Turn and it “thinks” you want to turn in that direction. If the snow blower keeps wanting to turn check to make sure the air pressure is the same in both tires. In summary, there are no problems with the new differential. The problems are “normal” issues that you will have with all snow blowers. Ariens has not seen any actual malfunctioning differentials. My 926038 Ariens just had the auto turn differential fail. It makes a grinding sound and slips. Less than five hours on the machine. Hi Mike, If your snow blower is less than 3 years old it should be still covered under warranty. I’m not that familiar with the differential in the old Ariens Pro so I can’t diagnose it here. If it’s not under warranty and you want to check it out yourself, tip the unit up on its nose and remove the bottom trans cover. You can inspect it and find the problem there. You local dealer will be able to get parts. Hi Bolis, There are a three good ones. Ariens Pro RapidTrack, Ariens PROFESSIONAL 36 HYDRO EFI, and the Honda HSS1332AT/HSS1332ATD. There is also the Husqvarna ST330T but it’s not listed as a commercial snow blower. If you have a large area to clear the Honda and Husqvarna track drives are considerably slower than the Ariens Pro and Ariens RapidTrack. Hi paul I dont like the friction disc drives.which HD. /commercial snow blowers would you recomend with the the more expensive hydro static or CVT transmisions. In a 30 in or so snow blower that will last a long time THANK YOU Bolis any info will begreatly appreciated.